This boutique country retreat for 14 is an absolute jewel, hidden in a quiet Somerset valley just 4 miles from Bath. There are 7 gorgeous designer bedrooms and 5 incredibly indulgent bathrooms, along with glamorous living areas, a stylish bar lounge, and a separate children’s games room and play area within extensive gardens. An idyllic central sun terrace creates a magical focus for your party, drawing everyone together for celebratory drinks and alfresco dining whenever the sun is out. This luxurious grade 2 listed Georgian home with sumptuous interiors and original artworks provides a unique setting for a super stylish get together. Wonderful for weddings, special birthdays, or perhaps to celebrate a new arrival and enjoy some restorative family time together. A blissful choice of bedrooms and lounges, a games room, lots of outdoor space and proximity to Bath, Stourhead, Stonehenge and other exciting day trips, provide a memorable experience for all ages. A Stunning Villa for 14 in a peaceful Somerset valley with 7 bedrooms, 5 bathrooms and 3 Living rooms. 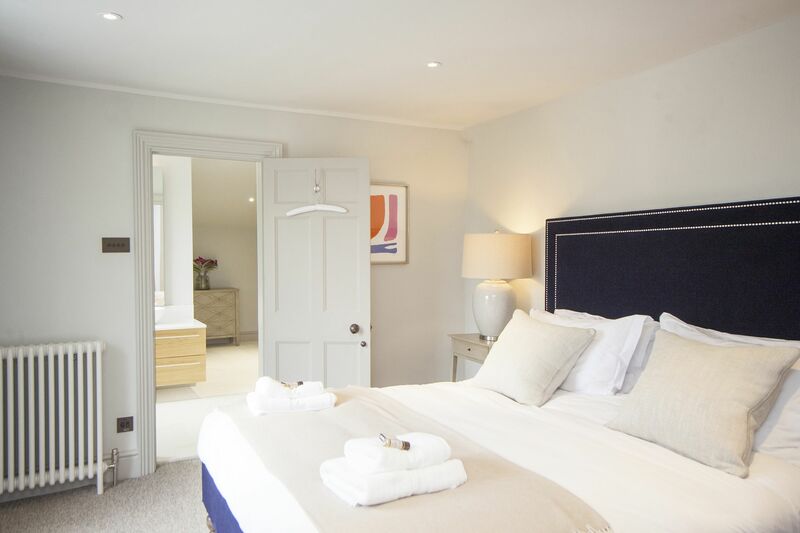 2 luxurious double bedrooms with 6’ beds and both with en-suite bathrooms. 2 charming double bedrooms with 4’6” double beds. 15 minutes to Bath by car. Built in 1742, this handsome Georgian house of honey-coloured stone has evolved over the centuries from simple farmhouse to a large, sophisticated and contemporary family home where you can bond together as a group or indulge in some private pamper time. 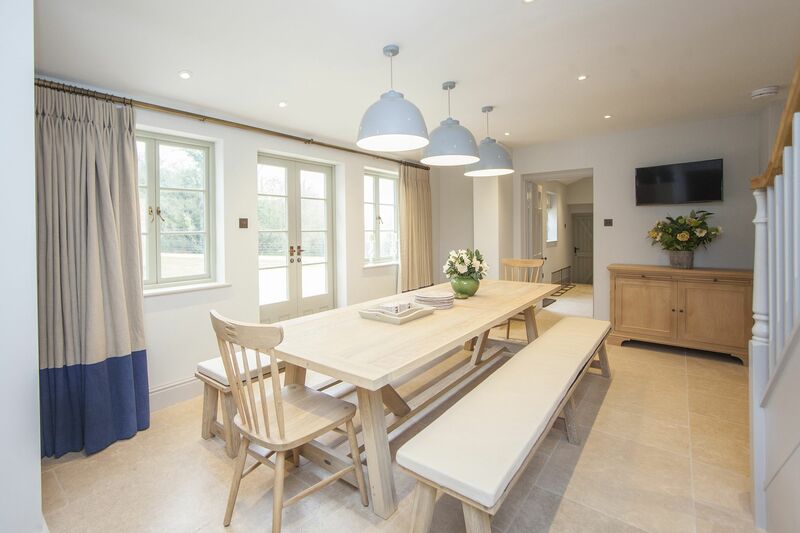 Re-imagined in a Mediterranean style, this accommodating house encompasses a central sun terrace with outdoor table and chairs for 14 and a BBQ, which makes the most of the lovely rural setting and is a natural magnet for the whole group in fine weather. This sunny, south-west facing outdoor space makes a relaxing place for a morning coffee and papers, a natural re-charging hub for roaming kids grabbing a snack, an ideal hot spot for a catch-up over tea and cake, and a romantic rendezvous when raising your glass in a toast over dinner. Finally, at the end of the day, it’s just heavenly for star gazing with your favourite tipple. The main house has a large lobby, several welcoming lounges, and a cloakroom on the ground floor, with 5 bedrooms and 4 bathrooms above, whilst the renovated west wing with French doors onto the terrace, has a fine contemporary kitchen and breakfast room, with 2 bedrooms and a bathroom above. Opposite the kitchen, and off the main lobby, is a bright and airy south-east facing orangery, providing an elegant dining area, with an entrance into the walled garden to one side. Garden paths lead around the house to a large north-east facing terrace with outdoor loungers and stone seating. A gravelled path takes you farther up into the grounds where a large field is good for playing sports or for a marquee for any special events. Inside the house, the ground floor spaces have been re-arranged to comfortably accommodate 21st century life. 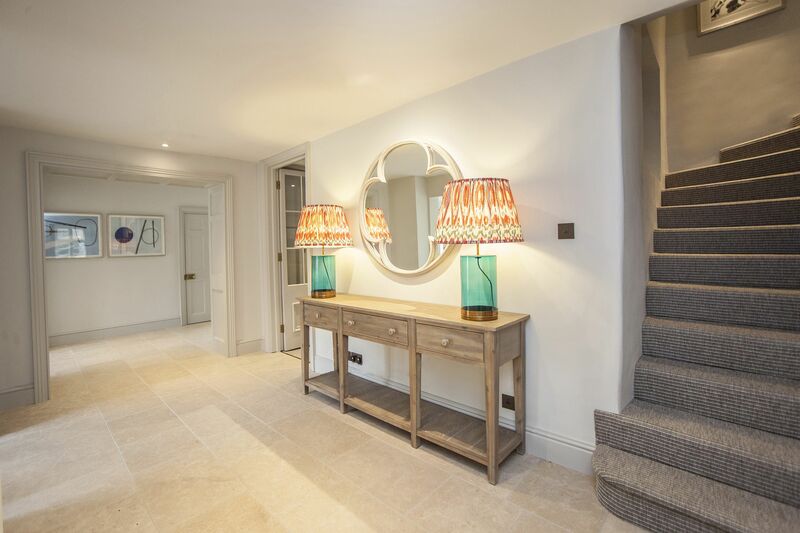 A new entrance at the centre of the house opens into a large lobby from where you can access the chic contemporty kitchen, a lavish TV room, a bar, drawing room and a cloakroom. Old and new come together seamlessly with smooth travertine stone floors, limed oak furniture and luxurious natural fabrics throughout. There are fine linen and velvet drapes alongside modernist artworks, little stone mullioned windows in decadent bathrooms and winding staircases up to designer bedrooms in jewel rich colours. Every room glows with colour and detail, inspiring room names in the precious stones which they most resemble. 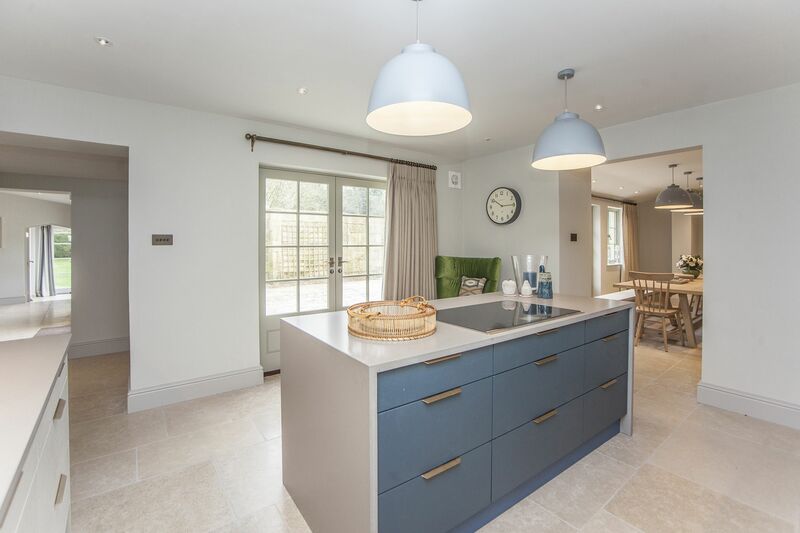 The former stable has been transformed into a contemporary linear kitchen and breakfast room in classic grey-green with travertine stone tile flooring. 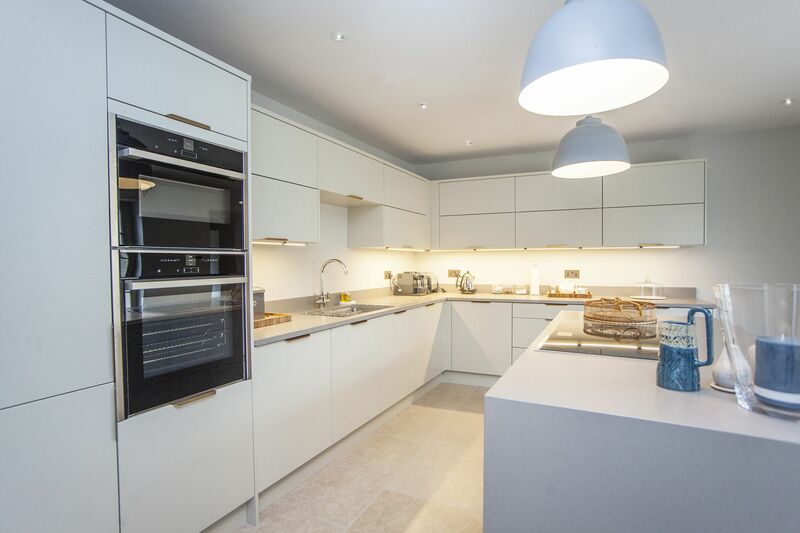 Pale oak wall units have been paired with grey stone tops and smooth drawers for a polished and seamless look. There are two pairs of French doors opening onto the terrace, making it easy to serve spontaneous outdoor meals. 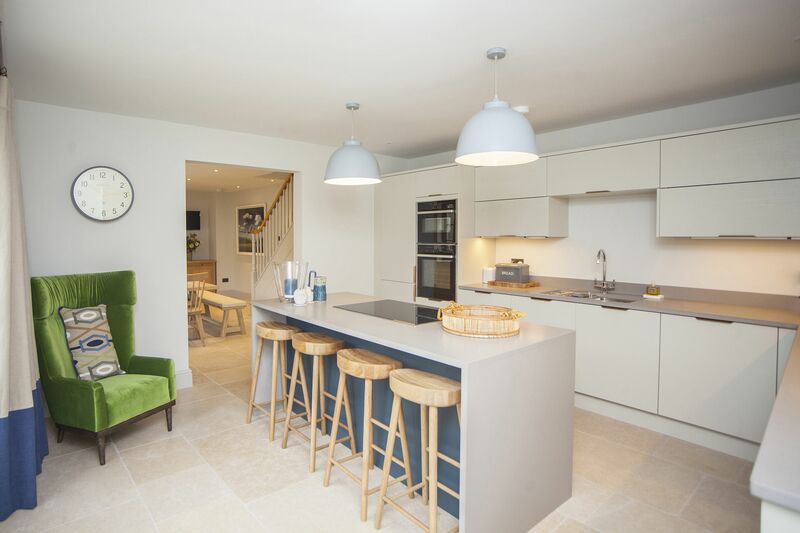 A smart central island has a large 4 ring induction hob and combines a preparation area and breakfast bar with 4 oak stools, whilst a modern green velvet winged chair is a snug spot for your favourite brew. The wall units have 2 programmable electric ovens, one of which can be a used as a microwave, also a large fridge, a separate freezer and a dishwasher. On the countertop is a Nespresso coffee machine with some coffee pods provided. The soft close cupboards contain a generous stack of crockery, glassware and cooking equipment. The breakfast area has a long limed oak table to seat 14 in total, with a rustic oak chair at both ends and long padded benches to seat 12 on either side. There is a pretty dresser with a small TV and sonos sound bar above it that has integrated Alexa voice-controlled music. A large under-stairs storage cupboard has utility items and also a separate pantry cupboard. 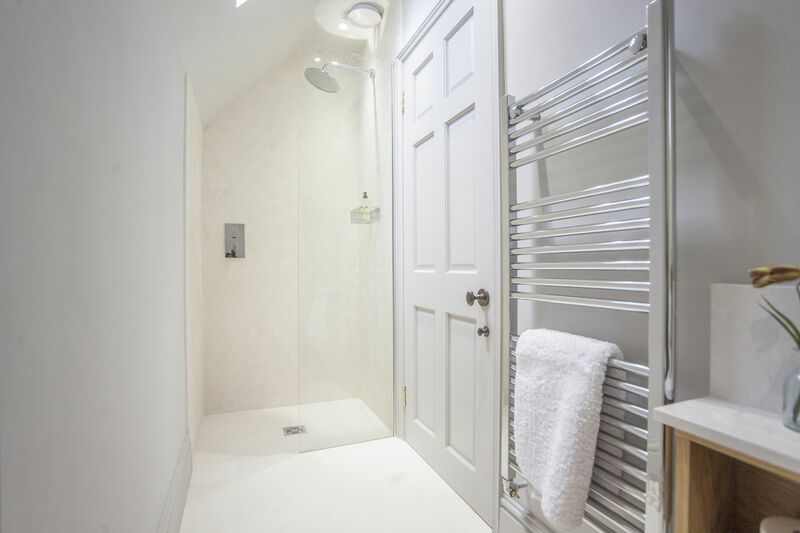 An open staircase leads up to the former hayloft with 2 lovely bedrooms and a shower room. 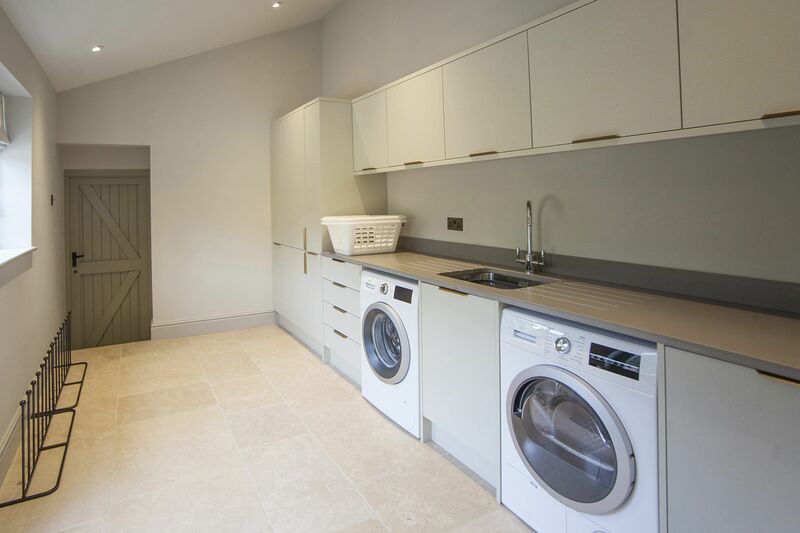 A large separate utility and boot room has smart fitted units similar to the kitchen area. There is another large fridge and separate freezer, a sink, a washing machine and separate dryer, along with a couple of laundry baskets and plenty of storage. Welly boot stands and outdoor cushions are situated beside the back door. A simple and striking entrance has a large black and white photo, a cow-hide bench and an easy chair with a sheepskin rug. A vestibule with a long console, decorative lamps and gothic mirror has doors to the living rooms, a boiler room, and an outer door to the north-east woodland and gardens. There is a large alcove with multiple coat hooks and a smart cloak room with a small hand-basin and WC with shelf space. 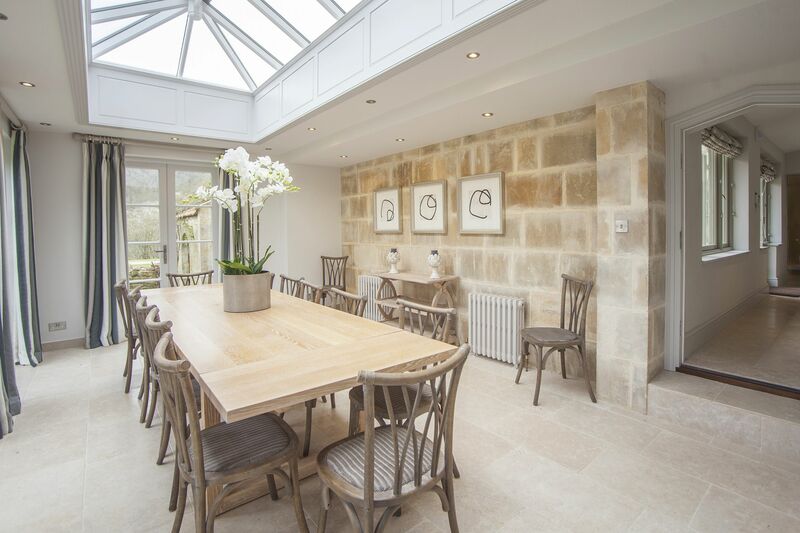 The sunny orangery has been elegantly styled as a dining room. There is subtle drama with 4 pairs of softly striped curtained French doors and a lantern skylight over a large washed oak dining table to seat 14. A shelved console sits against a warm stone wall with a trio of swirling monochrome prints. This large luscious snug in teal and amber velvet invites you to snuggle in. A decorative oak sideboard with large lamps, picture lights and a free standing lamp create soft lighting washing over a low beamed ceiling. This is the oldest room of the original farmhouse and small symmetrical stone mullioned windows with original shutters and a large decorative fireplace all combine to create a cosy atmosphere. There is a large wall mounted TV screen with Sonos soundbar and Netflix that can be comfortably viewed from a large sofa with chaise to seat 6 and a deep amber velvet armchair. On the wall are engaging artworks in complementary colours. 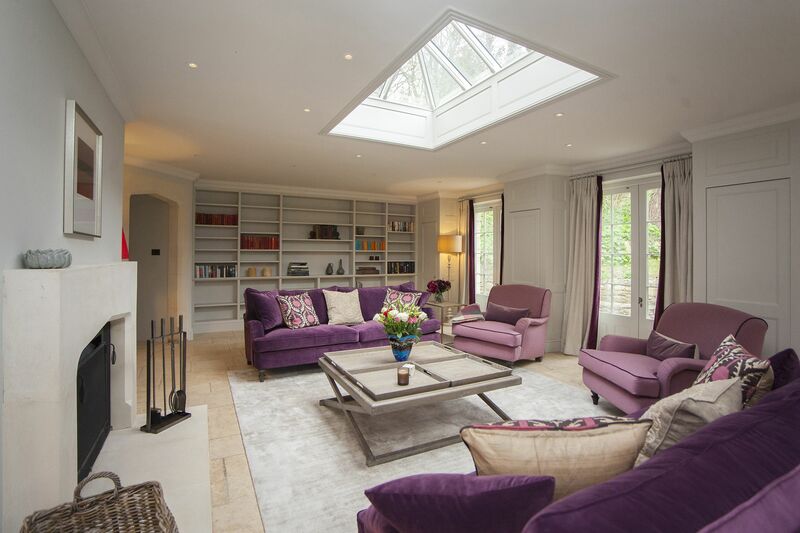 At the cocktail hour, a glamorous drawing room and library invites you to recline on 2 large amethyst sofas seating 6 and 2 ample armchairs, grouped around a large central coffee table inset with drinks trays. 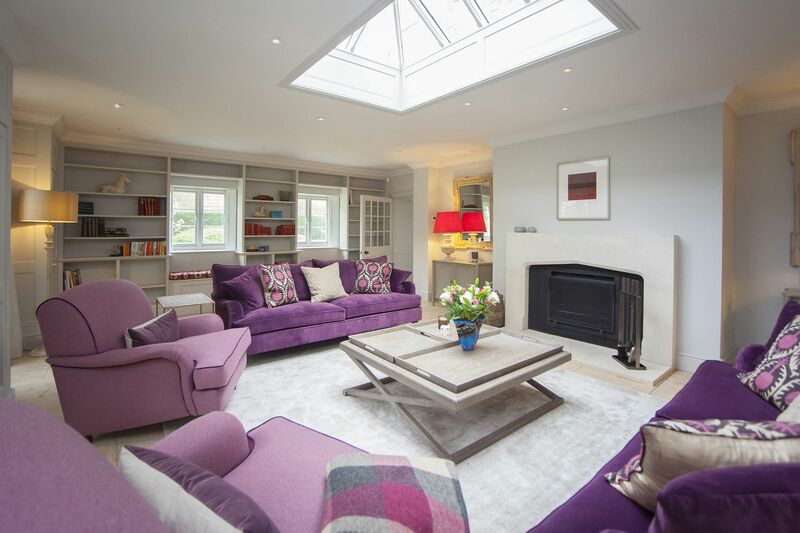 This spacious room has a large lantern sky light above and 3 pairs of beautifully draped French doors leading out onto a stone terrace and woodland gardens with outdoor seating. A large working fireplace has a log basket and fire tools to create a merry blaze. Deep alcoves on either side have small sideboards, rosy lamps and shimmering mirrors. A pair of Bluetooth Sonos speakers on the sideboards enable you to download your choice of music. Bookcases on either side of the room have a large selection of novels, coffee table books and games, whilst romantic window seats with plump padded cushions and reading lamps will tempt you to linger. Atmospheric and inky blue with handsome leather seating and a great bar, this is the place to gather for drinks after hours. There are 4 armchairs beside a grand original fire-place that now houses a cast iron wood-burning stove. Above the fireplace is a wall mounted TV with separate Sonos speakers. A long slate bar with 3 leather barstools has a shelf for drinks, a small sink, small fridge and plenty of storage for glasses, bottles and snacks. Next to a cool abstract print of Mick Jagger is an alcove cupboard, useful for storing wine and spirits. The Vestibule of the main house has a steep winding staircase leading to 5 bedrooms. 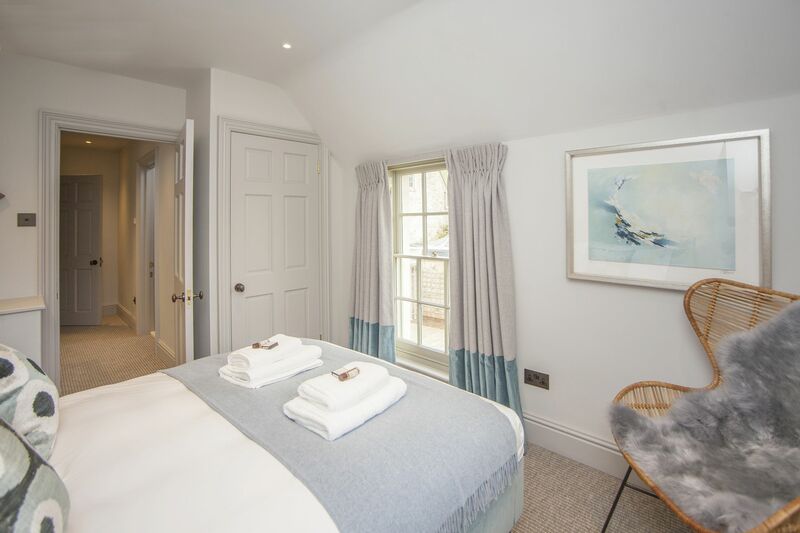 The 2 large principle bedrooms with en-suites are on the first floor, with 3 more bedrooms and 2 large bathrooms on the second floor under the eaves. 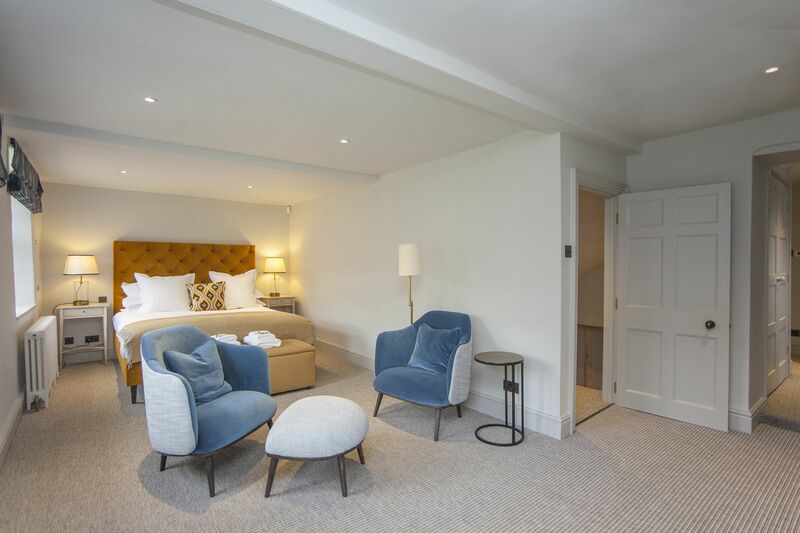 Live in luxury in the Amber Suite which has a hotel style bedroom, a separate dressing room and statement bathroom. 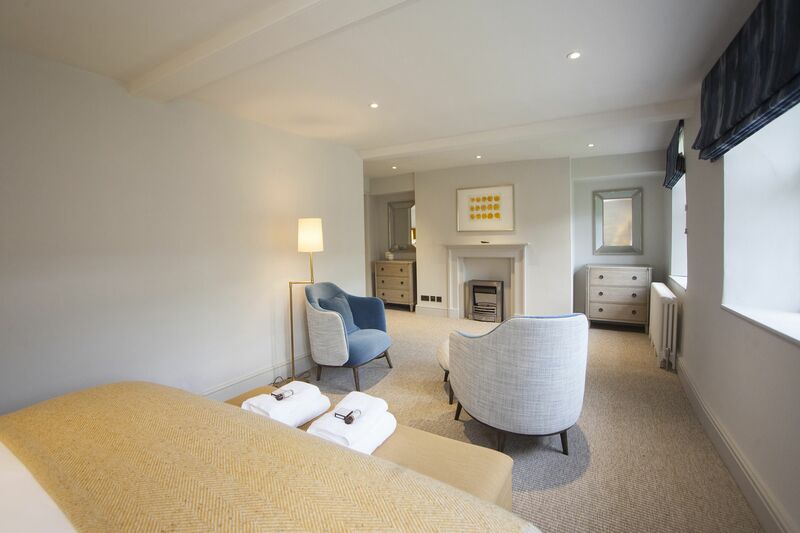 This spacious, golden bedroom has an amber coloured velvet 6’ double bed with a plush buttoned headboard, brass trimmed lamps and an upholstered blanket box at the foot. There are 3 deep windows overlooking the formal front garden and hillside to the south-east and a pair of teal club chairs with a footstool. Either side of a small electric coal effect fire, are 2 alcoves with a pair of matching chest of drawers and gold mirrors. The walk-in dressing room has a narrow wardrobe with hanging room and a shelf above along with a deep wardrobe with hanging and shelving inside, along with a dressing table top and storage shelves under with a hairdryer provided. 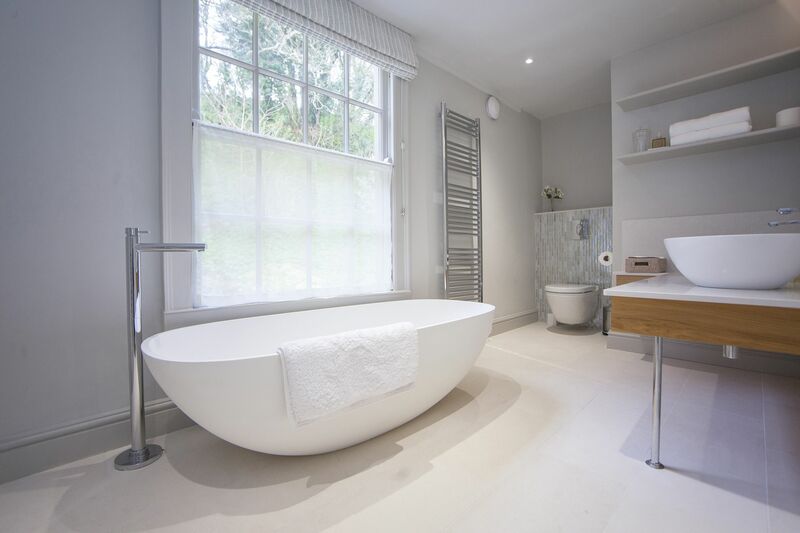 The stunning spa-style bathroom features a sculptural stone resin freestanding bath, 2 stone resin wash bowls on a stone plinth, a large walk-in shower and WC. 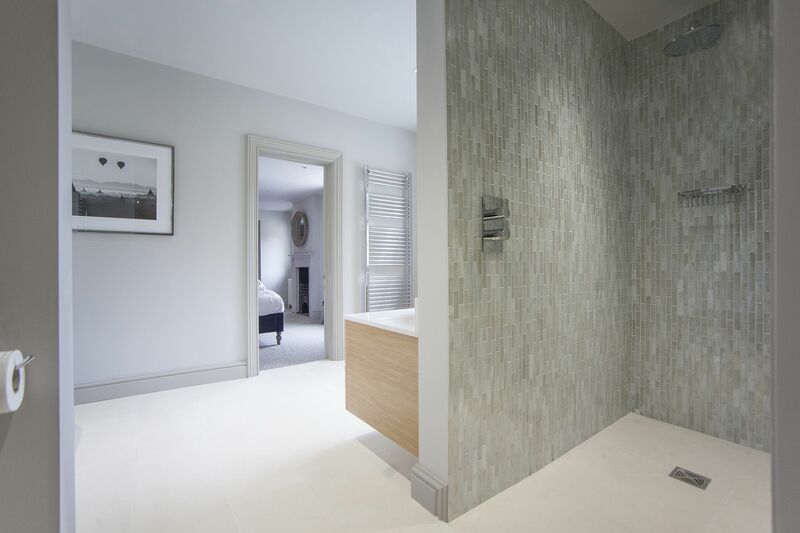 This tranquil room is tiled in smooth pale stone and pearlescent mosaic throughout. There are shelves above the hand-basin area for additional toiletries. 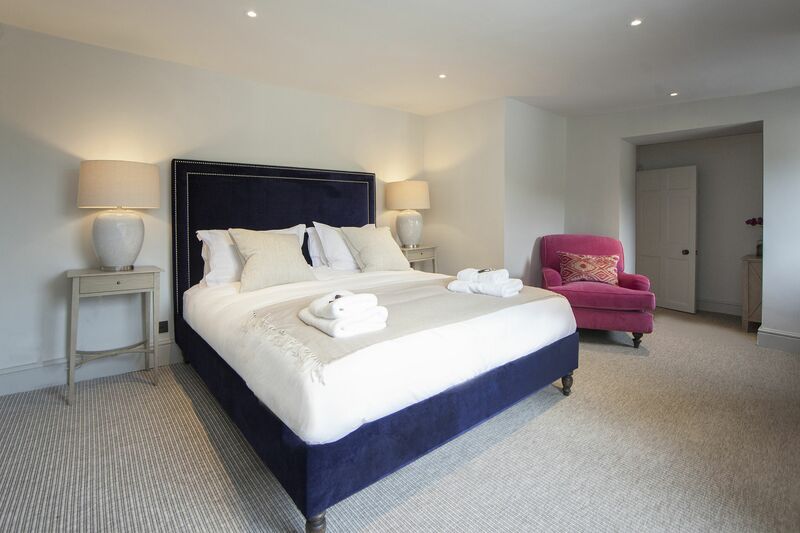 This sumptuous bedroom features a handsome 6’ double bed with a tall studded, dark blue velvet headboard and a fuchsia velvet armchair alongside. There is an original cast iron decorative fireplace and a window on either side overlooking the central terrace, the pony field and little valley beyond. A chest of drawers provides some storage with further storage facilities as part of the bathroom. The dreamy bathroom is perfect for pampering. 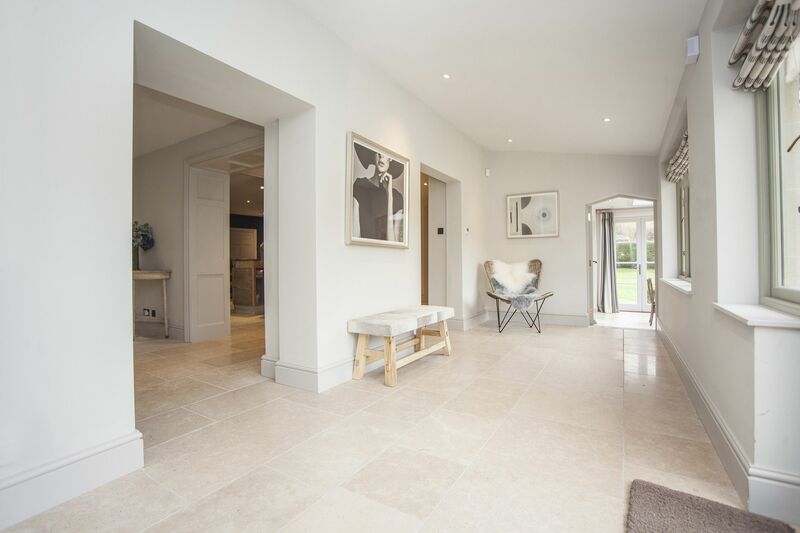 Luminous and spacious with windows on either side of the room, the natural organic shapes and pale stone flooring are easy and restful on the eye. 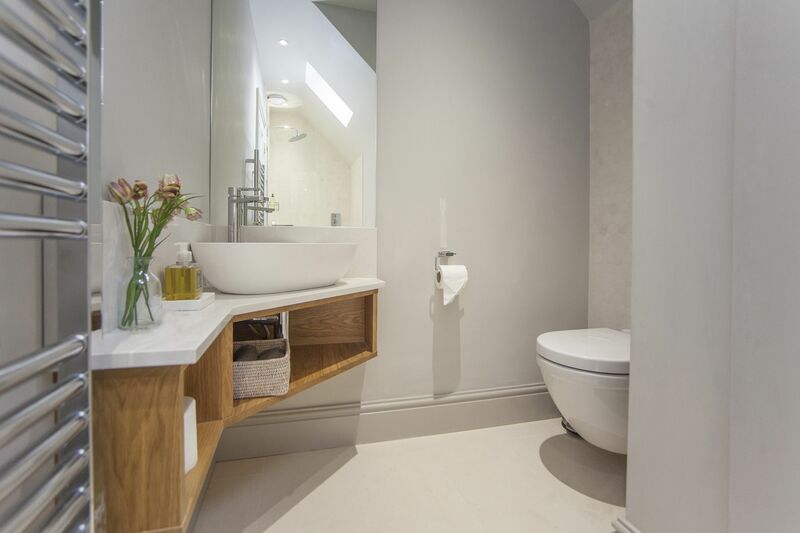 There is a deep contemporary freestanding stone resin bath along with 2 similar oval hand basins resting on a stone plinth with wide oak storage drawers under. The large walk-in shower is tiled throughout in gentle pearlescent mosaic tiles and has a rainfall shower overhead. There is a large storage area behind the shower with hanging rails and drawers and mirrors. On the second floor is a spacious twin room in peach and teal with pretty marbled lamp shades. There are two single 3’ beds that zip and link to become a 6’ double. 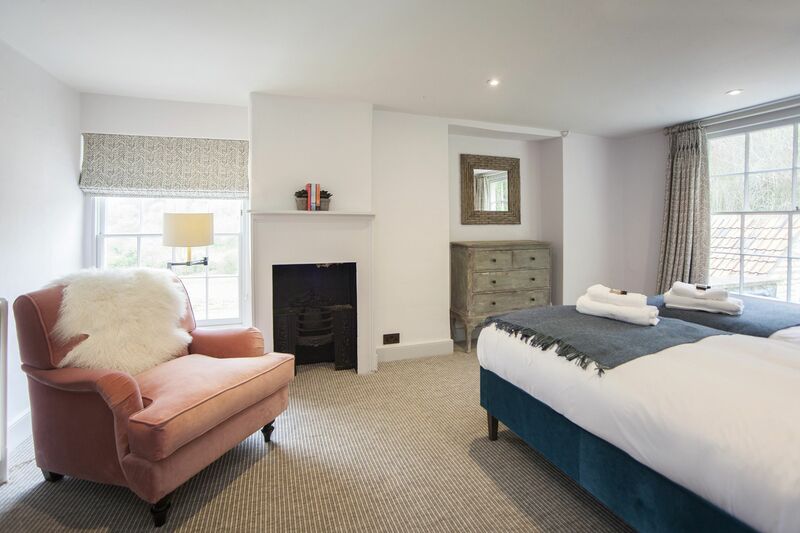 An ornate original cast iron fireplace has alcoves either side with a chest of drawers and a sweet pale pink velvet armchair with sheepskin throw. Some hanging space is provided on the wall. 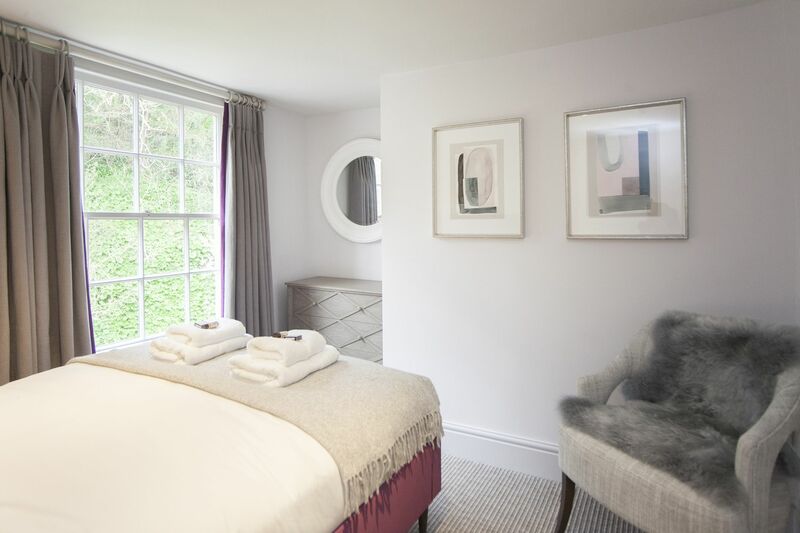 This charming compact bedroom in shades of mauve and grey, has a 4’6” double bed, a chest of drawers in an alcove with a round mirror above and a little occasional chair with a cosy grey sheepskin thrown over. 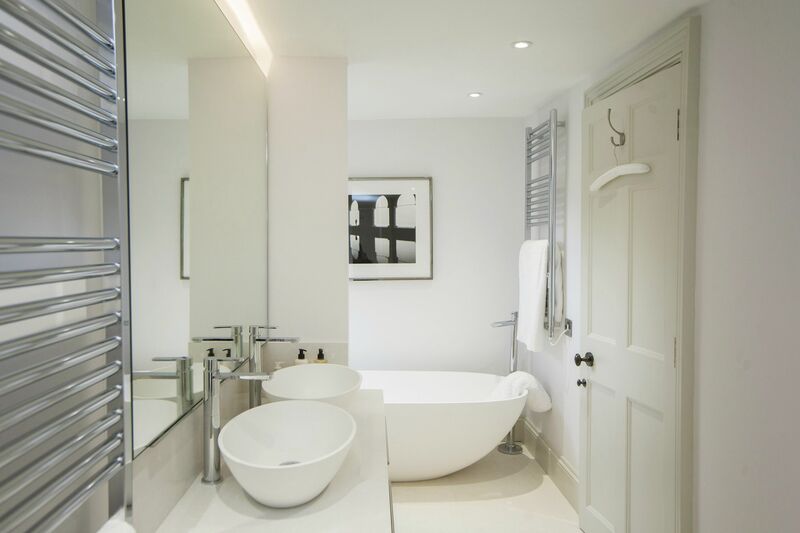 These two rooms share a fabulous bathroom with an oval shaped, stone resin free-standing bath, 2 oval hand-basins on a stone plinth with oak drawers under, a large walk-in tiled shower and a WC. 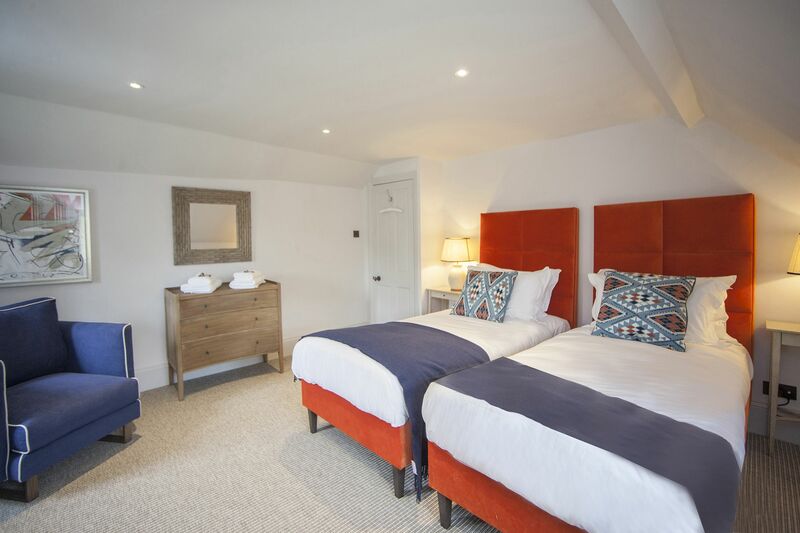 On the half landing under the eaves is a large smart orange and blue twin room with two single 3’ beds that zip and link to become a 6’ double. Fitted wardrobes line one wall with plenty of hanging space, shelving and storage cubbies. There are two little windows with original shutters and a comfortable piped navy armchair beside a striking framed abstract and a chest of drawers. Also under the eaves next to the topaz room is a lovely large linear bathroom, with an original oval stone feature window and little window seat. 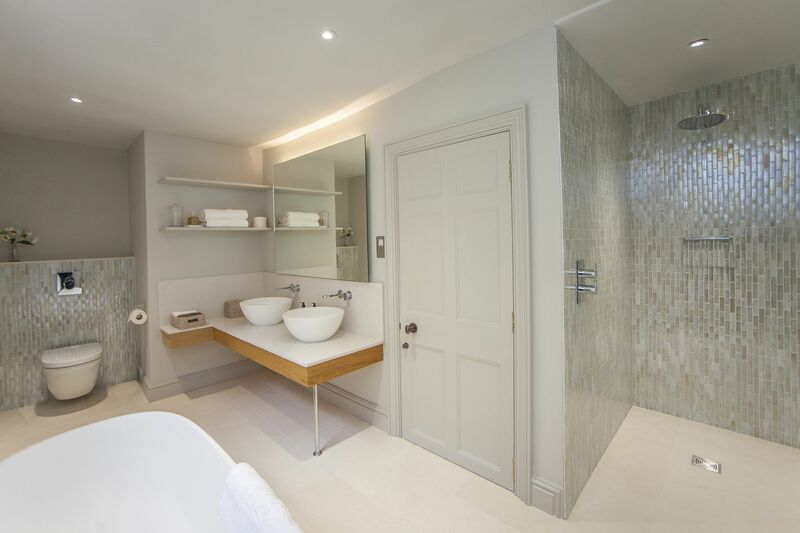 This very spacious and contemporary room has been beautifully tiled throughout and features a free-standing bath and a large walk-in shower. 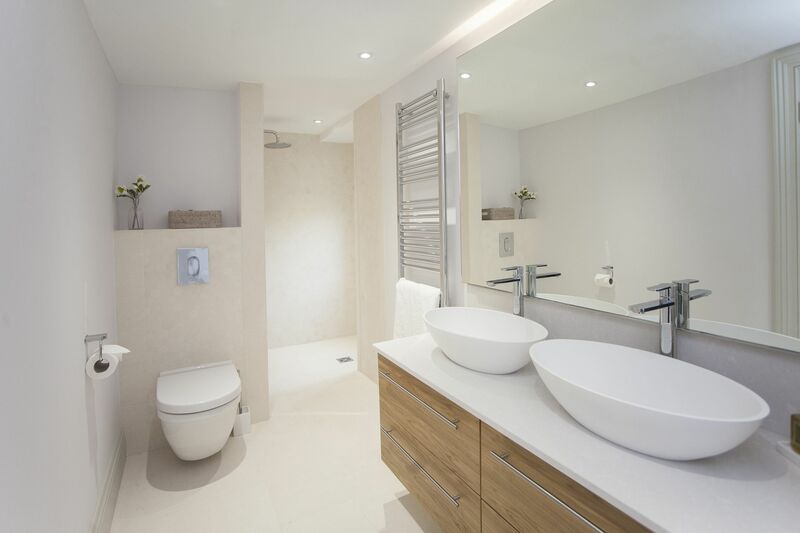 There is a large double hand-basin with a shelved alcove for additional toiletries and a WC. In the hayloft above the kitchen is a striking twin room with an apex roof and a unique oculus window at the gable end. 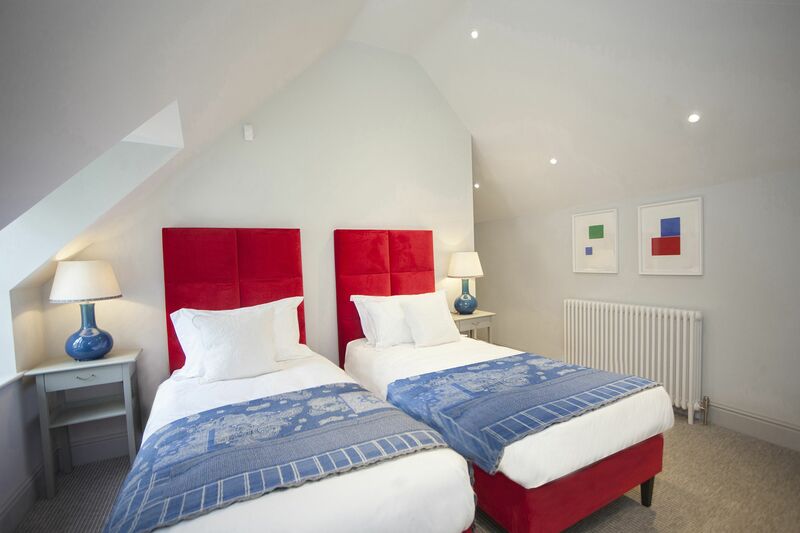 The lofty ceiling is emphasised with dramatic ruby velvet headboards and tall turquoise lamps. Two single 3’ beds zip and link to become a 6’ double and opposite these is a comfortable armchair, a chest of drawers and hanging rail. 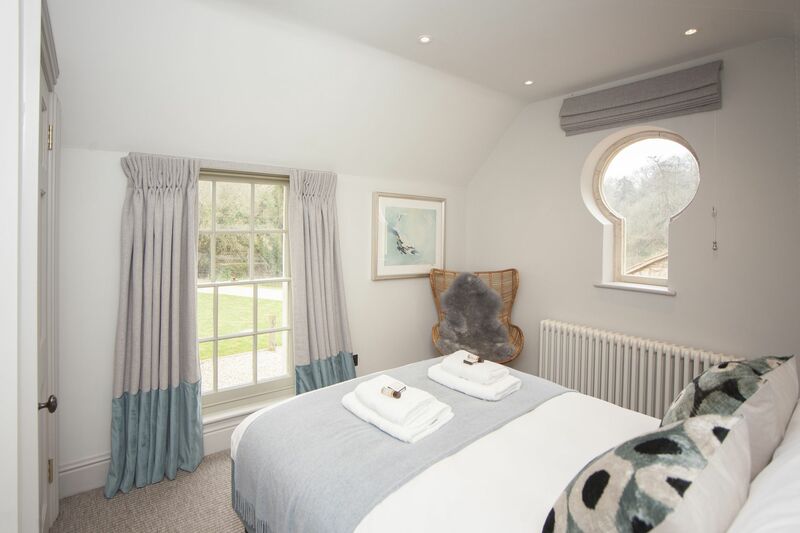 Another charming double bedroom in the hayloft has a striking keyhole oculi with views of the countryside and a large window over the courtyard. 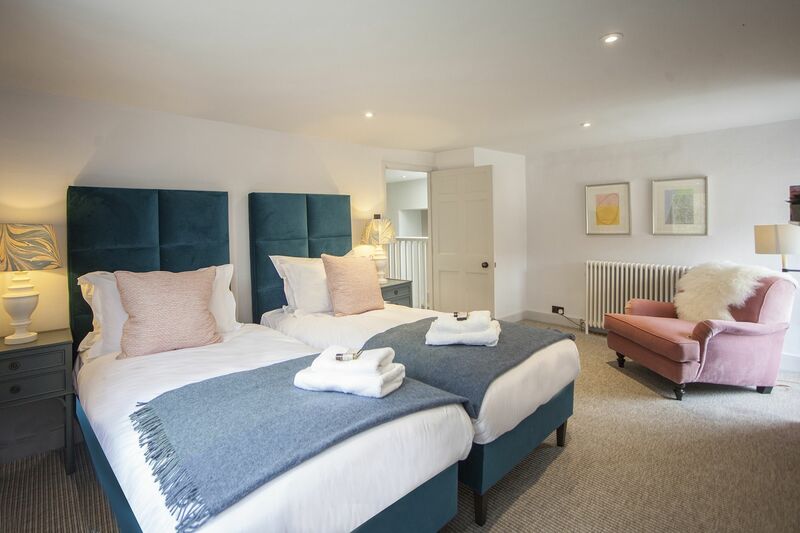 Aqua colours run through the furnishings which comprise of a 4’6” double bed, a large built-in wardrobe with shelf space and a dressing table space along with an easy chair with cosy sheepskin throw. 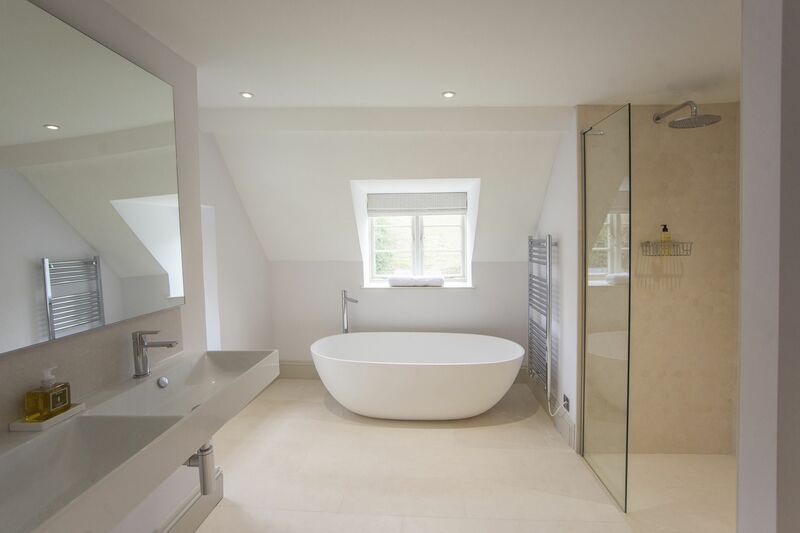 Between the bedrooms is an elegant contemporary shower room, neatly arranged and smartly tiled in pale grey. There is an oval corner hand-basin with shelf space under, a walk-in shower and a WC. 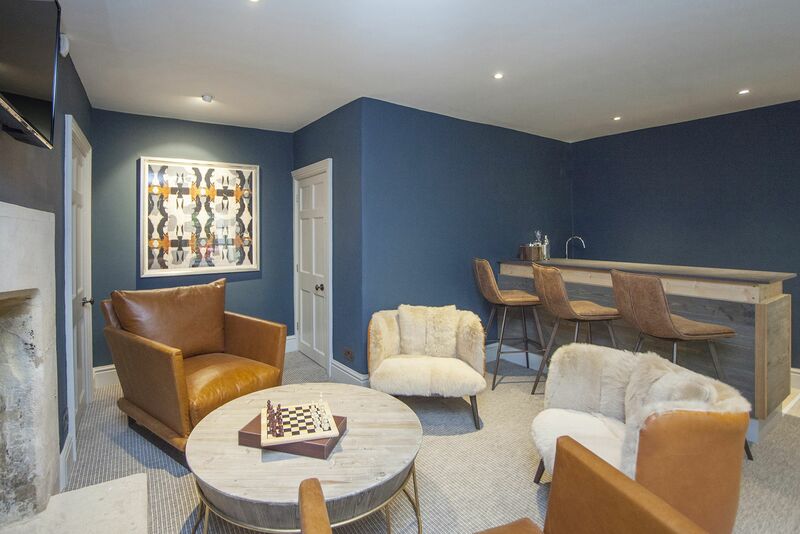 The Games room (Please note the games room will be finished in June 2019 so any bookings before then would be without the games room). In a separate room away from the main house is a dedicated games room with large screen for x-box fun and Netflix movies. There is comfortable seating and table football. The car port has a table tennis to hone those skills for an essential house tournament! This lovely home is house is nestled within a steep sided wooded valley leading south to the small village of Combe Hay and surrounded by meadows, farms and open countryside. There are formal walled gardens to the front dating back to the 18th century, planted with box hedges, wisteria and climbing roses. A stone path around the house leads to a second terrace outside the drawing room with outdoor seating and stone steps to a raised lawn. A gravelled path with between yew trees goes into an apple orchard with an outdoor play structure for young children. (Will be installed by June 2019). A gap in the hedge leads into a large field with space for football, and rounders with vehicle access onto the historic track road once used by stone quarries. This area would also be suitable for a small marquee. There are many delightful country walks and cycle routes around Combe Hay, Wellow and Midford and with lovely country pubs on route. There is so much to do in the area and Wendy from Zest concierge can organise horse trekking, archery, Clay Pigeon Shooting, Fishing, Nature Farm and History walks. Zest can also organise a personal chef to cater for your weekend, various therapies, including massage, life drawings etc. It is a few minutes drive to Odd down park and ride which has frequent buses into Bath town center. The Wheatsheaf (01225 833504) is a sensational gastro-pub in Combe Hay. It's about 30 minutes walking distance. Book ahead, as it is very popular. The food is truly outstanding and when the sun is out you can enjoy al fresco dining for lunch or dinner. The Fox and Badger (01225 832293) in Wellow is a good country Pub. The George Inn (01373 834224) is an historic 700year old inn, with cosy bars and ancient galleried courtyard. It is a short drive to Norton St Philip. The Inn at Freshford (01225 722250) is a pretty country pub in a lovely village. It is a short drive or could be incorporated to a country walk. The New Inn at Lower Westwood (01225 863123) is a short drive past Freshford, towards Bradford on Avon and is a nice place to stop during a walk. The Beautiful Georgian city of Bath is very near and has many historic venues to visit including the Roman Baths, The Royal Crescent, the Bath Abbey and the Assembly rooms. Enjoy the hot mineral waters of the Thermae Spa, see a show at The Theatre Royal or The Komedia. There are plenty of great shops, restaurants, bars, cafes, museums and galleries to visit. You can enjoy a day out at Stonehenge, Longleat, Stourhead or Cheddar Gorge, all less than an hour away by car. This is a new property. It has been renovated and refurbished in 2019. We welcome your visit and would love for you to be the first to experience this truly exceptional property.